HMV has agreed to sell the art deco venue, which opened in 1932 as the Gaumont Palace cinema, to Stage C for £32 million as part of a wider turnaround. 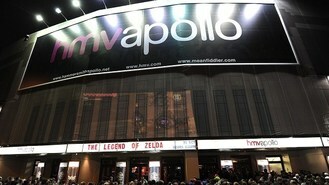 The 9,000-capacity venue was taken over by HMV in 2010. It has played host to a number of legendary performances, including David Bowie's last concert as alter-ego Ziggy Stardust in 1973. It is also the eponymous venue in the popular BBC stand-up comedy series Live at the Apollo. HMV chief executive Simon Fox said: "The Hammersmith Apollo is an iconic London venue and it has been a privilege to own it over the last three years." Stage C is jointly owned by London O2 operator Ansco Music Club, a subsidiary of US company Anschutz Entertainment, and a subsidiary of Munich-based CTS Eventim. The sale is conditional on shareholder approval, banking approvals and Stage C securing regulatory approvals. HMV said that once the deal is sealed, the group will see £220 million in bank loans extended to September 2014. With 252 stores in the UK, HMV said the sale allows it to focus on its core retail business, while the proceeds from the disposal will be used to reduce the group's outstanding debt. The sale follows a decision to place its HMV Live division, which runs 13 venues and a number of festivals including Lovebox in London and Global Gathering near Stratford-upon-Avon, under review. While HMV has felt the pressure of the consumer spending squeeze as people turn to cheaper deals on the internet for music and film, it recently surprised the City by forecasting a return to profit in 2013 despite estimated losses of around £19 million for the last financial year.